JSC Atomenergoexport was established in 1973. Currently, we are one of the largest exporters of isotopic products in Russia. At present our company is one of the largest exporters of isotopic products made in Russia. It is a former engineering company. JSC Atomenergoexport was established as early as in 1973, in the Soviet Union. For several decades the company had been one of the key players in the market of nuclear power plants construction. The objects of the company were securing and coordination of works on implementation of intergovernmental agreements on cooperation in the area of nuclear power energy. JSC Atomenergoexport has built 31 NPP units with the total capacity of 16.6 mln. kW. Temelín NPP; Dukovany NPP; Kozloduy NPP; and others. JSC Atomenergoexport is the member of The Guild of Logistic operators of the Moscow Chamber of Commerce and industry. 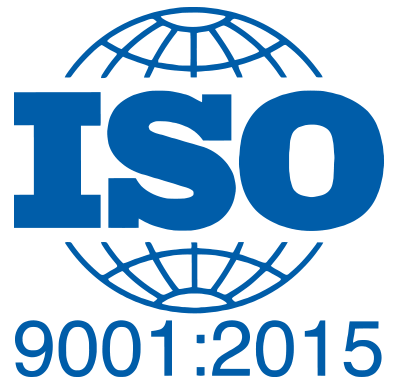 The management system conforms to ISO 9001:2000. The contribution of our company into industrial development and international trade was denoted in 1980 by the international Golden Mercury award. The last project of JSC Atomenergoexport was designing and commissioning of co-generation plant at the beginning of 2011 in Dobrush, Belarusian. 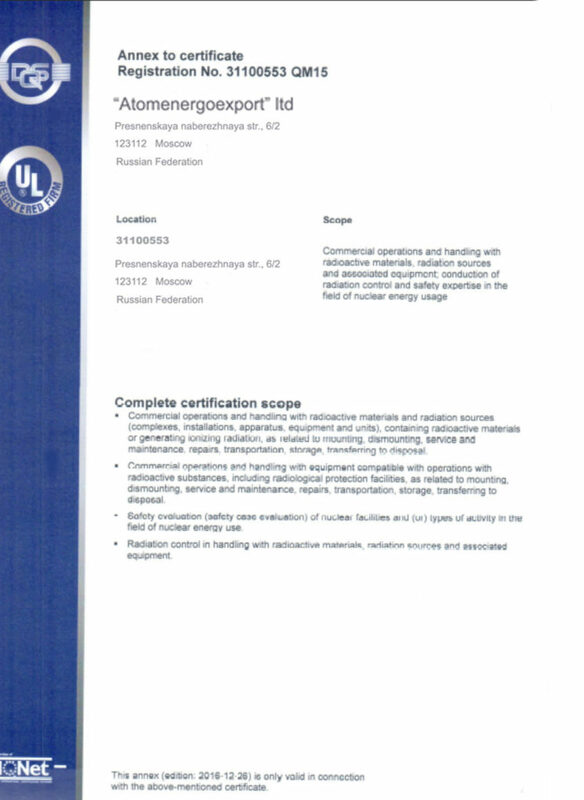 As a result of reengineering in 2012, the company Atomenergoexport ltd, which up to that moment had been an intrastructural subdivision of JSC Atomenergoexport, started its independent commercial activity. Sazonov D.V., who had been in the Border of Directors, was appointed as Director General. Export of isotopic products became the main activity of our company. 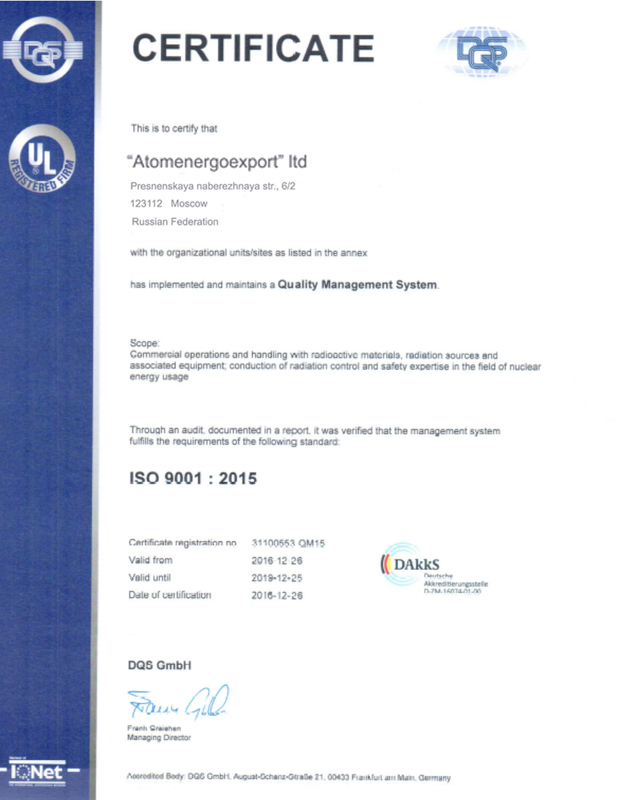 JSC Atomenergoexport is the critical link which connects Russian manufacturers of isotopes and their clients in foreign and national markets. Our company is the largest supplier of “Selenium 74”, manufactured at SC “PA “Electrochemical plant” (Zelenogorsk). It is well-known that this plant produces the best “Selenium 74” in the world, but it doesn’t trade directly with foreign companies. Our company is the connecting link between manufacturing plant and your company, and due to our help you can purchase “Selenium 74” of the best quality with the isotopic purity up to 99.98% at the lowest price. We perform the delivery to any place in the world. We have been a full range supplier of isotope products manufactured by fission, cyclotron, electomagnetic and gas-centrifugal technologies. Our company offers its customers stable and radioactive isotopes, sealed radioactive sources, generators, specialized equipment for radioactive materials treatment, etc. We endeavor to keep diversifying our product portfolio and adding new hi-tech products. We use a systematic and integrated approach to sales of isotope products, radiation equipment and equipment for general and medical use. This strategy, together with the company’s unique experience, enables us to implement large-scale investment projects quickly and efficiently. Costumer orientation and on-time delivery are the two cornerstones of our isotope supply business. One of our key goals is creation of efficient service and distribution systems, which are an indispensable component of gaining global leadership in isotope sales. Our company possesses a substantial nuclear safety expertise and develops active cooperation with leading international organizations aimed at reducing the threat posed by radiological materials. Our company takes pride in its team of highly qualified professionals with unique experience. Our policy helps us meet domestic and foreign market demands while ensuring safety at all stages of product handling and service rendering. To get more detailed information on our products, please fill-in the contact form or connect us in any other way which is convenient to you.You are welcome for cooperation. We consider the applications from any companies and physical persons. Our experts will respond you as soon as possible. The communication is only in English.